Rwandan Police, military and correctional service peacekeepers, on April 13, came together in their respective UN mission areas to mark the end of the 25th commemoration week of the 1994 Genocide against the Tutsi. 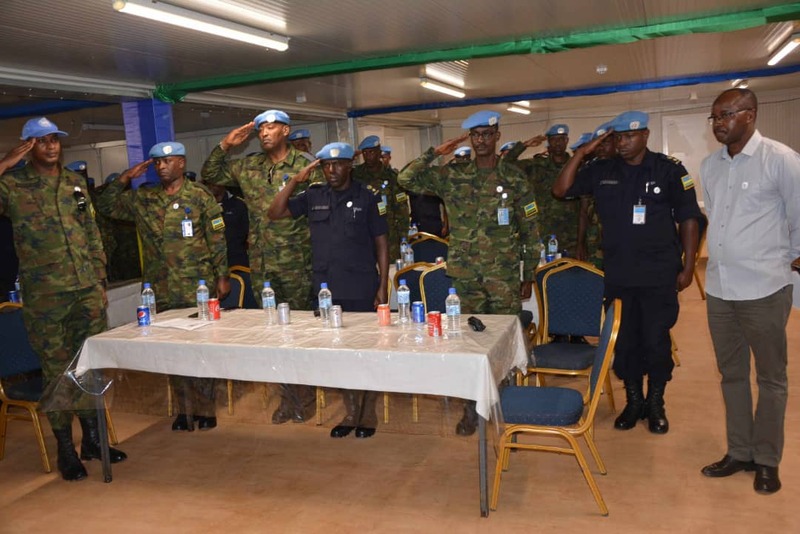 The Rwandan blue berets were joined by Rwandans living or working in these countries, senior government and UN officials, fellow peacekeepers as well as local residents. In South Sudan, the activities to remember were held in the capital Juba and Malakal of Upper Nile region where Rwanda Police and military contingents as well as Police and military advisors are deployed. The event was presided over by Governor of Upper Nile Region, James Tor Monyboung. Present was also Hazel Dewet, UNMISS Head of Field Office and UNMISS Sector North commander, Brig. Gen Akou Adjei Kofi, among others. “We are learning a lot from you, currently Rwanda is one of the nations with good leadership and we thank you for choosing the best ways to overcome and to tranform your country against all odds,” Mr. Monyboung said. He noted that the commemoration period is the lesson to the whole world that what happened in Rwanda 25 years ago should never happen elsewhere. “The restoration of hope among the people of Rwanda has taken a lot of efforts and resilience of the people has been one of the factors to success. Today Rwanda is a stable and peaceful country active in its domestic, regional and international affairs including participating in peacekeeping operations,” he added. In Central African Republic (CAR), the commemoration event was held at the Rwandan military peacekeepers’ base camp Socatel M’POKO in the capital Bangui. Joseph Mukasa, who spoke on behalf of the Rwandan Diaspora in CAR, elaborated on how the Genocide that claimed more than one million innocent lives in a space of 100 days, was prepared and executed. “The pre-colonial and post-colonial Rwanda planted seeds of discrimination and hatred, divisionism and dehumanizing a group they called minority and Tutsis was a symbol of rule, and the 1994 Genocide against the Tutsi was inevitable as their intention was to eliminate them,” Mukasa said. Mukasa went on highlight ten steps that characterized Genocide; classification, symbolization, discrimination, dehumanization, organization, polarization, preparation, persecution, execution and denial. He urged the young people , to beware of the true history that characterized Rwanda and recommit to fighting genocide ideology and denial. He thanked the leadership and people of CAR as well as other peacekeepers for being with Rwandans in remembering.